Synthetic peptide conjugated to KLH, corresponding to a region within C terminal amino acids 68-98 of Human MCP1. 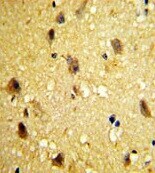 HeLa whole cell lysate (ab150035); Human brain tissue; HeLa cells. 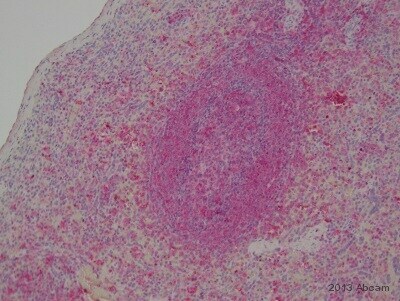 ab135599 is prepared by Saturated Ammonium Sulfate (SAS) precipitation followed by dialysis against PBS. Our Abpromise guarantee covers the use of ab135599 in the following tested applications. WB 1/50 - 1/100. Predicted molecular weight: 11 kDa. Immunohistochemical analysis of formalin fixed, paraffin embedded Human brain tissue labelling MCP1 with ab135599 at 1/50 dilution followed by peroxidase-conjugated secondary antibody and DAB staining. Flow cytometric analysis of HeLa cells labelling MCP1 with ab135599 at 1/10 dilution (bottom histogram) compared to a negative control cell (top histogram). 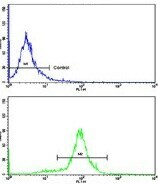 FITC conjugated Goat anti-rabbit secondary antibodies were used for the analysis. Immunofluorescence analysis of HeLa cells labelling MCP1 with ab135599 at 0.025 mg/ml dilution followed by FITC-conjugated goat anti-rabbit lgG (whole molecule). 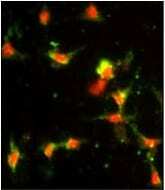 FITC emits green fluorescence.Red counterstaining is PI. 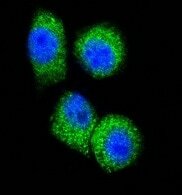 Confocal immunofluorescent analysis of HeLa cells labelling MCP1 with ab135599 at 1/10 dilution, followed by Alexa Fluor® 488 conjugated Goat anti-rabbit lgG (green). DAPI was used to stain the cell nucleus (blue). ab135599 has not yet been referenced specifically in any publications. Publishing research using ab135599? Please let us know so that we can cite the reference in this datasheet.